Earlier today, the Capital Bikeshare program launched in DC and Arlington with a crowd of volunteers riding the bikes to the stations that had been installed around the city over the past few weeks. Capital Bikeshare will be replacing the old SmartBike system that has been in the city for a few years now. I never used that one, but I think I may actually join Capital Bikeshare. The new program corrects some of my biggest issues with the old one - and all of them boil down to convenience. Stations. 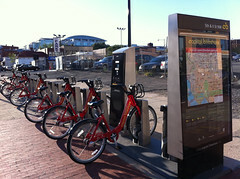 There are going to be 114 stations around DC and Arlington with over 1100 bikes available. They aren't all operational yet, but most of the ones in the downtown area were included in the launch today. Returning bikes. With SmartBike, you had to return the bike to the station you got it from. Let's be realistic: if you don't own a bike and are using a bike sharing program, you're riding to something, not just going for a loop around the neighborhood. With stations all over the city, it'll be convenient to ride from where you are to where you want to be and check in the bike when you get there. Membership. You can do yearly, monthly, or 24-hour memberships. Yearly and monthly members get a key fob that unlocks a bike. For 24-hour usage, you scan your credit card right at the kiosk. Pricing. The first half hour is free. Up to 90 minutes is modestly priced. For every half hour after that, it's a steep six bucks. This makes sense: if you want a bike for the day, rent from any of the bike rental places in the city. These bikes are for getting around town, not for day trips. The high price of long rentals will discourage people from using them for long periods of time, which means they will be available when people want them. More bikes in the city. For all the reasons mentioned above, I expect more people to use the new program than the old. And anything that gets more people on bikes, I support. I've been following the news about this program and wanted to take it for a spin, so rather than taking my own bike, I used the Bikeshare to get to a meetup this evening. Location, Location, Location. There is a station one block from my front door. My meetup was right on Dupont Circle, and there's a Bikeshare station on the opposite side of the circle. Not all parts of the city have stations yet, but the busier parts do. The Bikes. These bikes are designed for heavy usage by a wide variety of people, so they aren't quite what I'm used to. They allow you to sit up straight, they weigh a ton, and the gearing is really low (three speed internal gears). But, they have built-in lights with a dynamo hub, fenders and a chain guard, a basket on the front with a bungee cord built in, and even a bell. They aren't designed for racing, but they're going to be a good fit for most people. Probably. They have an introductory rate of $50 for the first year and I'm tempted to take advantage of it. I can see myself using this in a couple situations. One way trips. If I'm out with friends and end the night near a station, I'd generally rather ride home than take the metro. Even if I didn't ride on the way out, I have the option of riding on the way home. Cases where I don't want to take my bike. Here's a great example. Last week I went to a concert over on H St in northeast. It had been drizzly all afternoon. I didn't really know the area around the venue, so I had no idea if there were any good places to lock up my bike. And, I would be riding the brand new bike I had acquired only a week before. I wasn't too anxious to ride it to an unknown neighborhood and chain it up in the rain where I might not have a decent bike rack available to me, so I opted for the bus. The two Bikeshare stations that will be near that section of H St aren't operational yet, but this would have been a perfect use of the service. I could have biked to and from the show without worrying the slightest bit about my precious new bike. I doubt I'll use it often. I have a new bike that I love, and I certainly wouldn't want to do any substantial riding on those bikes - really, I can't imagine myself ever running over the first half hour that comes free. But, I can definitely see myself using it in cases where I would normally take the train or bus, and it would probably save me more than $50 a year in Metro fares by doing so. Definitely. If you live in the city and don't already own a bike, you should definitely join. The Capital Bikeshare site includes a map of all the operational stations. A second map shows the location of proposed stations that are not yet available. Spotcycle has a mobile app for iPhone, BlackBerry, and Android for use with the program. I've been playing with the iPhone app this afternoon and really like it. It finds stations nearby and can tell you how many bikes and open docks are currently available at a given station - and it's free! Someone also linked to Bixou in a comment I saw. I haven't tried that one, but it appears to have similar functionality and costs a buck.